Rate of distance covered with respect to time. Speed is one of the basic measurement of motion. It is a scalar quantity, it has only magnitude but no direction. Galileo was the first person to give definition and formula for speed. Welcome to NEETLab – A 100% Free Online Self-learning platform to improve your intelligence and to clear NEET examination. 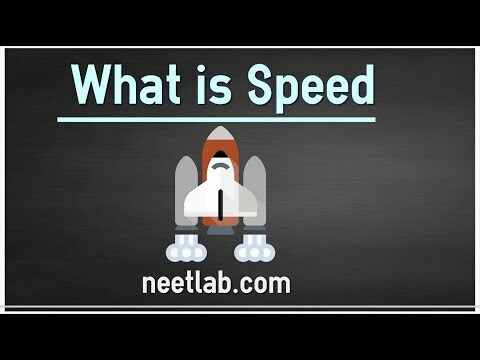 In this video, we are going to understand what is speed. Understanding Speed is the basic concept for learning all types of motion. Infact the basic measurement of motion is speed. Please watch this video till the end, so that you grasp this concept completely. To understand this concept, you should have clear understanding of the base concepts such as Motion. If you do not have clear understanding of these base concepts, we recommend learning those concepts before watching this video. Don’t go anywhere, visit neetlab.com and search for these concepts. If you are watching this video from neetlab.com, you can find the links to these concepts as well as important NEET questions from this concept below this video. How do you go to school? Do you go by walk or in bicyle. 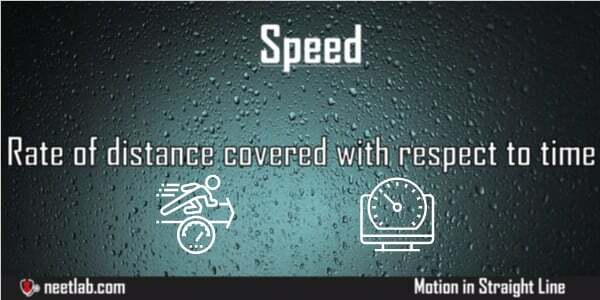 Lets try to understand the meaning of speed by comparing these two modes of travel. Speed is nothing but a measure of how fast something is going. An athlete measures his running speed by using a stop watch. He runs a fixed distance and measures the time taken. Based on these two, he calculates his running speed. Lets take another example. Lets say your school is located at 1 kilometer from your house. If you reach your school in 15 minutes, then your speed is 1 kilometer per 15 minutes. Speed represents how far you can go in a certain amount of time. If you go with your dad to school in bike, then probably you can reach the school within 5 minutes. What it means is that speed of bike travel is 1 kilometer per 5 mins. Speed is generally represented in secs or hours depending on the duration of the time taken. Things which cover small distances are generally measured in seconds and things which travel longer distances are measured in hours. You would have observed that the speedometer of the bike displays the speed of the bike in kilometers per hour. When the speedometer displays 80, it means that the bike is going at 80 kilometers per hour. If you go at that speed for next one hour, then you would have covered 80 kilometers. When the time is kept constant, if distance increases, speed also increases. also, When distance is kept constant, if time increases, speed decreases. Lets undertand the statement when time increases, speed decreases. You need to go to nearby town which is 100 kms away. Generally you take 1 hours to reach the town when you go by car. But this time, you decided to go by bus, the bus took 2 hours to reach. Here the distance is constant, but the time increased from 1 hour to 2 hours, so what would happen to the speed, it would decrease. Lets calculate how much speed decreased. In case of car, 100 kms covered in 1 hour so speed is 100 kms/hour but in bus case 100 kms covered in 2 hours, so speed is 100 kms/2 hour. That is 50 kms/hour. The speed decreased from 100 kms /hour to 50 kms/hour. Now that you have understood speed, let me see if I can confuse your understanding. When you travel, the speedometer does not show the arrow at 100 kms throughout the travel. It starts from zero and increases and when you reach the highway, it stabilises at 120 kms/hour. When you cross villages in between, and when you take turns you have to reduce the speed from 120 kms/hour to 30 or 40 kms/hour. So the speed changes all the time. When the speed changes throughout your travel, why we say that the speed is 100 kms/hour. Think for a while before proceeding with the video. Now let me introduce you another term, instantaneous speed. The varying speed at any instant of time during your travel should not be called as speed, the correct name to call that is instantaneous speed. After you complete the travel, you find the average speed by calculating the total distance covered and the total time taken. What we call as speed is actually the average speed at which you have travelled. Do you like trains? Lets travel with train to another city B. The train travels from our city A to another city B with the speed of 60 kmph and while travelling back from city B to our city A it travels with the speed of 70 kmph. Can you say what is the average speed of train for the whole trip? To calculate speed, I need distance and the total time taken. But in this question, only two speeds are given. Lets assume that the distance between two cities is X. Then total distance is 2X. Are you preparing for NEET examination? If so, try out NEETLab challenge to find out whether you will clear the NEET Examination. That brings up to the end of this video. Lets quickly recap our understanding of speed. The distance covered in 1 hour is called as speed. Even though the SI unit of time is seconds, in real life we use hour when we talk about speed. Did you understand this concept clearly, if so please appreciate us by clicking the thumbs up button. If we could not help you understand speed or if you have any doubts in this concept, Please put your doubts in the comments below. Explore related concepts such as displacement, velocity and acceleration. If you are interested to understand more concepts rather than simply memorizing the definition, Please subscribe to this channel. Don’t forget to click the bell button after you subscribe. Thanks for learning with us. Happy Learning With NEETLab. Six to Eight questions will be theoretical.